On August 9, the day after the Georgia invasion began, Cosmonaut Oleg Kononenko photographed the battlefield for "humanitarian" reasons. The new conflict has made many nervous about cooperation with Russia. 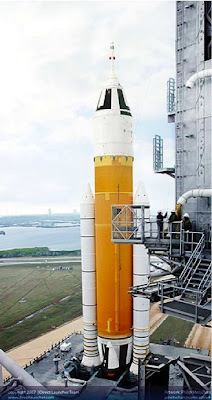 After the Shuttles are retired in 2010, Orion will take at least 5 years to be operational. During the gap, ISS astronauts would be dependent on the Russian Soyuz. "Given all of these considerations, we believe that it is imperative, as NASA continues the transition from the Space Shuttle to the successor vehicles, that the means for producing additional flight hardware and obtaining additional flight engineering and support services, not be completely or irretrievably lost through destruction or deterioration, at least until a clear path to alternative launch capabilities is at hand. At a minimum, we request that you direct NASA to take no action for at least one year from now that would preclude the extended use of the Space Shuttle beyond 2010. We understand that several such actions are pending in the near future, and believe that allowing them to continue would remove an option for US human spaceflight capability that must not be irretrievably lost at this time." Extending Shuttle past 2010 would be expensive and possibly dangerous. The fixed costs are 3 billion per year, even if Shuttles are only flown 1-2 times. Many of the 1970's parts would be difficult to replace. In his NASA blog, Shuttle Program Manager Wayne Hale has weighed in. He points to the many difficulties and risks of extending Shuttle past 2010. "In probably 15 to 18 months would would have the parts to build that second tank -- only a year or so later than we needed them. So a new gap would form. Not between shuttle and orion but between shuttle and shuttle. And what would we get: even higher price per flight of an old technology which is not nearly as safe as we would like . . .
"Hey, I am the biggest shuttle hugger there is. I think it is the best spacecraft ever built. But I also deal in the real world. Where does the money come from? Where do the people -- who should be working on the moon rocket -- where do they come from? We started shutting down the shuttle four years ago. That horse has left the barn." The vital tooling for 8.4 meter external tank is scheduled to be retired. Even if Shuttle never flies after 2010, the jigs would be needed for the DIRECT architecture. DIRECT would use the same launch pads and 4-segment boosters as Shuttle. This option should be preserved for the next administration. The COTS program is an outside possibility. COTS D, an option that NASA has not yet ordered, would provide passenger transport to ISS. COTS D would have immediate commercial applications, such as bringing passengers to Bigelow's orbiting habitats. Possibly commercial Space would save us from the gap. As this is written, Elon Musk's SpaceX is working feverishly. Sometime in September they will try for the fourth time to launch Falcon 1 into orbit. If this is successful, the larger Falcon 9 will be tested in 2009, with demonstration flights to ISS in 2010. If all goes well, passenger flights could start in 2011. We continue to wish them good fortune. UPDATE: Both the Orlando Sentinel and nasaspaceflight.com report that NASA is now studying extending the Shuttle past 2010. That might prevent Launch Complex 39 from being modified, further delaying Constellation. These decisions are going to shape the next century in Space. Do people care?